I was recently sent the Handstand Kids, Baking Around the World Cookbook Kit to review. I was excited to get this baking cookbook because my 9 year old daughter, Olivia, loves to cook and bake. I like to call her my little chef. She is actually able to do baking all on her own, but I still supervise. I remember at her age I loved baking and then being creative frosting the cakes. Olivia was thrilled to get the cookbook, she wanted to make something right away. But because of school we waited for the perfect Saturday to bake. Not only is the baking cookbook filled with great recipes, the kit also included a whisk and 4 baking cups. It was tough to decide which recipe to bake but we finally decide on the Vanilla Cupcakes in a Cone. We had almost all the ingredients on hand, except for the cones. A quick run to the store fixed that. The cookbook's recipes are given a certain number of cupcakes on the top of the recipe page to tell you the difficulty of each recipe. The Vanilla Cupcakes in a Cone has 3 cupcakes, so it's considered a little more difficult. With two of my little chefs ready to bake, my 7 year old Isabella joined in the fun, so I stepped aside and was there for support. They were able to read the directions, and do just about all the steps on their own. I actually poured the batter into the cones, but it was only because they were anxious to get them baked. There weren't as many cupcakes as the recipe stated but recipes always vary. Olivia and Isabella frosted some of the cupcakes in a cone with me. Olivia decided to top her own frosted cupcake with whipped cream and sprinkles and enjoyed it very much! Next time we are going to try putting something in the middle of the cupcakes since the frosting is only on top. 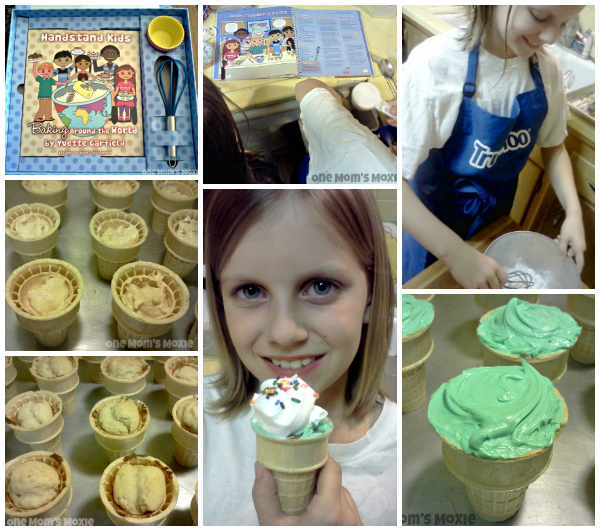 We give the Handstand Kids, Baking Around the World Cookbook Kit, 5 cupcakes which is equal to 5 stars! Visit their website to purchase your own Handstand Kids cookbook. They also carry other cookbook kits and cooking accessories. You can follow Handstand Kids on Facebook & Twitter to watch for great recipes and giveaways.